Decorating your cupcakes and tray bakes has never been so magical. Use this legendary creature-turn-practical receptacle to dust your sweet treats with sparkle and glitz for an instant dazzling effect. Simply fill this marvelous creature with delicious goodies and then dust any delicious treat to your hearts content. This is the perfect gift for any budding baker or cake creator. 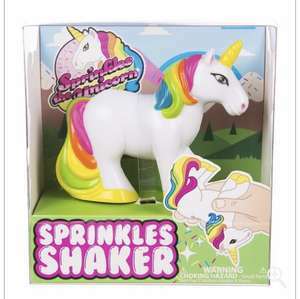 The Unicorn Sprinkler Shaker is a mythical fantasy turned into an edible reality that no one will be able to resist. Mary Berry would be proud!